This is the time of year that many of us take on the project of spring cleaning our home. We take time to clear our spaces and organize them. Well just like spring cleaning our homes, our finances could benefit from spring cleaning as well. 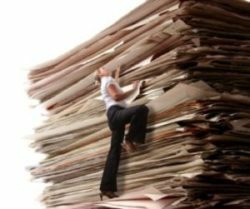 Now that your taxes are done you probably have a stack of paperwork. This is a good time to get that paper organized. Not only does the paper clutter our homes but it contains information that can be used for identity theft. In addition, it is critical to be able to locate documents in the event of a disaster or death. As you organize your files, you should be able to answer these questions: Do you have all the records you should? What documents should you keep and for how long? How should the records be organized and where should you keep the records? To answer these questions, start with a good document checklist. These can be found online. Also, don’t forget to shred documents no longer needed. Is your credit report accurate? You don’t want to wait until you apply for credit to find out your credit report is inaccurate. A good practice is to request a copy of your credit report at least annually. You are entitled to one free credit report per year. Go to: http://www.annualcreditreport.com. We all know how important it is to live within our means but it is equally important to identify where your money is being spent. Reviewing your spending plan also helps you identify areas where you can potentially reallocate to fund your goals. You can save time and energy by using a personal finance software program such as mint.com or quicken.com to track and categorize your spending. It is an easy way to measure your spending to your goals. This is a good time to review your goals that you established at the beginning of the year. Have you made progress towards the goal? If not, is it still important to you? If the goal is still important to you maybe you need to consider how to automate your approach. For example, if you have a goal of saving an additional $100 per month, you can set up an automatic transfer from your checking to savings once or twice a month. Your financial plan should be reviewed and updated on an annual basis and/or as your goals change. It is also important that you revisit and update your plan when you have major life changes. If you have had any major changes recently then now would be a good time to review and update your plan. Take some time to spring clean your financial house. Following the above tips will help you make progress towards building a solid foundation to your financial house. Are you are having a difficult time taking the necessary steps to move forward with the “practical side” of your finances? Take my “Money Type Quiz” to learn more about your relationship with money. Only you see the results.